For the many thousands of New Yorkers who live with asthma – including an estimated 174,000 children under the age of 12 – the winter months can often be particularly painful and debilitating. Cold, dry air outdoors, and in poorly heated spaces indoors, constricts nasal passages and the body’s other airways, exacerbating asthmatic conditions. The long hours typically spent indoors during the winter also increase exposure to the allergens, like mice, cockroaches, and mold, that can trigger attacks. Poor-quality housing is strongly associated with asthma morbidity – that is, the condition of being diseased. Children living in high-poverty households as well as Black and Latino children are also disproportionately likely to be diagnosed with asthma. Prevalence also varies by place; in 2010, nearly a third of asthma-related emergency room visits in New York City were children from the Bronx. And that doesn’t even tell the whole story; asthma rates tend to be underestimated, largely due to lack of primary care and diagnosis for many people. The New York City Department of Health tracks and analyzes avoidable asthma hospitalization rates for adults—i.e., those that could have been prevented by quality outpatient care. A map of preventable asthma hospitalizations makes evident a connection between them and the amount of public housing in a neighborhood (click on the map above to see the connections). Residents in neighborhoods with high rates of avoidable asthma hospitalizations and high concentrations of public housing— mainly in the South Bronx and central Brooklyn—are also more likely to report fair-to-poor housing conditions. This connection suggests several possibilities, namely that New Yorkers living in public housing may have higher asthma rates than other New Yorkers, that public housing residents may have less access to education and medication to manage asthma and thus avoid hospitalization, and that conditions in public housing trigger asthma attacks. Most likely, it is some combination of these factors. The poor living conditions in New York City Housing Authority (NYCHA) housing developments, including heating and mold issues, are common knowledge among New Yorkers. Last June, a consent decree between New York City officials and federal prosecutors sought to settle a lawsuit brought by NYCHA residents concerning decrepit and unsafe conditions, including apartment mold and failing furnaces. Initially, the parties agreed to the appointment of an outside monitor with authority to ensure that NYCHA remedied such unsafe and unhealthy conditions. In November, however, the federal judge overseeing the case rejected the consent decree as written, finding its enforcement mechanisms too vague. At this point, it’s unclear whether the judge will accept an amended consent decree that satisfies his concerns – or whether the housing authority might be placed under a judicially appointed receiver with more direct authority over NYCHA. What is clear is that the costs required to repair leaking roofs, mitigate mold, and address other factors related to asthma attacks across the more than 300 public housing developments in the city far outstrip available resources. 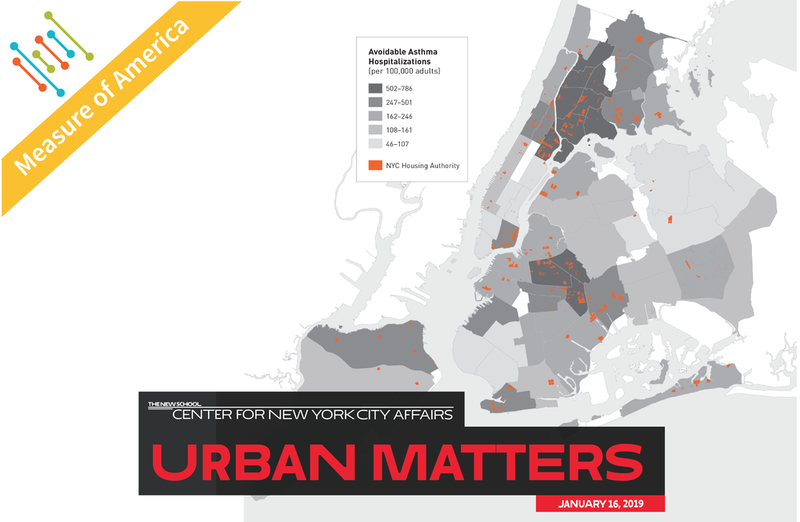 How City, State, and Federal housing officials resolve this problem remains a major question hanging over public housing – and public health, including reducing asthma prevalence and improving treatment – in New York. Kristen Lewis is director and Sarah Burd-Sharps was formerly co-director of Measure of America. Measure of America, a non-partisan project of the non-profit Social Science Research Council, provides easy-to-use yet methodologically sound tools for understanding well-being and opportunity in America. Through reports, online tools, and evidence-based research, we work with partners to breathe new life into numbers, using data to identify areas of need, pinpoint levers of change, and track progress over time. Bruce Cory is the editorial advisor at the center for New York City Affairs.